You may have heard in the press that the Vatican has criticized harshly the Leadership Conference of Women Religious (LCWR) for what the Vatican terms “serious doctrinal problems.” The LCWR says it represents 80 percent of America’s 57,000 Catholic nuns. It is influential both in the United States and globally. Apparently the Vatican believes the LCWR focuses too much attention on poverty and social justice concerns and not enough on abortion and gay marriage. Published reports say the Vatican (i) said the LCWR had been “silent on the right to life” and had failed to make the “Biblical view of family life and human sexuality” a central plank in its agenda, (ii) accused the group of promoting “certain radical feminist themes incompatible with the Catholic faith,” and (iii) criticized American nuns for expressing, from time to time, positions on political issues that differed from views held by American bishops because such disagreement with the bishops, “the church’s authentic teachers of faith and morals,” is unacceptable. To address these urgent problems, the Vatican named Seattle Archbishop Peter Sartain, Bishop Leonard Blair of Toledo, Ohio, and Bishop Thomas John Paprocki of Springfield, Illinois, to undertake reforms of the LCWR’s statutes, programs, and its application of liturgical texts, a process it said could take up to five years. There is a leadership group within our Church who has for decades tolerated and enabled criminal sexual abuse of children by ordained ministers in our Church. That group is not the LCWR. There is a leadership group within our Church whose members have for decades knowingly transferred criminal sexual abusers from parish to parish without notice to parishioners and without effective controls to prevent further injury and crimes upon innocents. That group is not the LCWR. There is a leadership group within our Church who, ten years ago, adopted new norms for handling allegations of sexual abuse by clerics and has thereafter turned a blind eye when its members criticize, ignore, and even violate those norms. That group is not the LCWR. There is a leadership group within our Church whose gross and reckless disregard for the welfare of children in its care and its arrogant refusal to accept personal responsibility for its conduct and the conduct of its members has driven thousands of Catholics out of the Church. That group is not the LCWR. There is a leadership group within our Church whose negligence and intentional disregard for the welfare of innocent children in its care has cost the People of God billions of dollars and may well continue to cost the People of God even more billions in years to come. That group is not the LCWR. The USCCB and its members have been doing a good enough job on their own of convincing the country that the only “Catholic political issues” are abortion and gay marriage. By emphasizing social justice, poverty, health care, education, and peace the LCWR and its members remind us that the mission of Catholics is service of the Gospel in all its glory. The USCCB and its members have been doing a good enough job on their own of offering aid, comfort, and political cover to particular political parties. By daring to disagree with these positions, the LCWR and its members remind us that our Church officials owe us servant leadership, not institutional paralysis. The USCCB and its members have been doing a good enough job on their own of burying their heads in the sand in the face of the critical shortage of priests to serve the People of God. By challenging us to examine “radical feminist themes” (translation: ordination of women) the LCWR and its members remind us that it is the Eucharist that is the “source and summit” of our faith, not the male, celibate priesthood. None of us is perfect. No group of us is perfect. Not the LCWR, not the USCCB, certainly not VOTFOC. But when the Church we love is facing life and death issues, is it really “servant leadership” to lead a witch hunt against our dedicated nuns? When there are giant logs in the eyes of the USCCB and its members, is it really in service of the Gospel to attempt surgery on any mote in the eye of the LCWR and its members? Wouldn’t it have been wonderful if the USCCB’s response to the Vatican directive about LCWR was a simple “Nuts to that!”? Since we will likely wait a long time for such a response, we suggest that is it up to us, the People of God, to stand up and announce “Nuts to that!” We encourage you to discuss this with others who love our Church as you do. We urge you to forward this message to those you know who care what kind of Church we hand on to our children and grandchildren. We invite you to discuss this message with the priests of your parish and diocese. Please write the Vatican at: Prefect Cardinal William Joseph Levada, Sacred Congregation for the Doctrine of the Faith, Piazza del S. Uffizio 11, 00193 Rome, Vatican City. 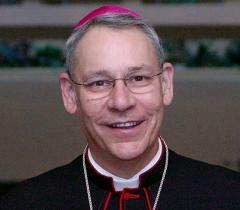 Send Cardinal Levada (formerly of San Francisco) an email at cdf@cfaith.va. Please write Bishop Brown at: Bishop Tod D. Brown, Bishop of Orange, P. O. Box 14195, Orange, CA 92863-1595. (Write to your local bishop.) Ask them for an explanation of just how the Vatican can justify this “visitation” (persecution?) of the LCWR and yet maintain their public silence regarding the USCCB’s scandal. Let’s make sure that the Vatican and Bishop Brown knows that we care about these important matters, that we have opinions about them, and that we want our voices to be heard. This is our duty and our right. We are the Church. We are the Body of Christ. As the priests’ trial continues in Philadelphia, The New York Times reports on abuse survivors’ testimony — 2 Abuse Victims Testify at Church Official’s Trial – NYTimes.com. Since last Wednesday, Apr. 18, when the Vatican Congregation for the Doctrine of the Faith mandated reform of the Leadership Council for Women Religious, commentary supporting the sisters has been getting louder. An example is today’s Grace on the Margins column by Jamie Manson, who writes regularly in in National Catholic Reporter. Those following the story will recall that the Vatican is faulting the sisters for doctrinal impurity. Manson recalls Pope Benedict XVI’s Holy Thursday sermon on a false obedience of human “caprice” and points out how the sisters’ “devotion is founded on a radical obedience to the voice of God as it emerges from the voices of the poor, the sick, the abandoned and the broken.” You may read her entire column online, LCWR: A radical obedience to the voice of God in our time. Jamie L. Manson received her Master of Divinity degree from Yale Divinity School, where she studied Catholic theology and sexual ethics. Her columns for NCR earned her a first prize Catholic Press Association award for Best Column/Regular Commentary in 2010. She will speak at Voice of the Faithful’s 10th Year Conference in Boston this September. As the Vatican’s Congregation for the Doctrine of the Faith comes down on women religious in the United States for doctrinal impurity, Roman Catholic Church reform movement Voice of the Faithful supports the sisters. On Wednesday, the Vatican mandated reform of the Leadership Conference of Women Religious, the largest leadership body of women religious in the United States, which represents about 80 percent of the 57,000 nuns in the country. Because of LCWR’s purported doctrinal impurity, the Vatican has appointed an archbishop to oversee the nuns’ reform. The record of women religious in this country taking care of the most vulnerable in our society, creating the American hospital system, for example, is a primer on Gospel values. Their long service on the front lines of poverty and disease is worthy of the respect and admiration of all, VOTF among them. Canon Lawyers are not giving LCWR much of a chance against the Vatican, which started LCWR in 1956 and to which the sisters answer. Comments supporting the sisters will be forwarded to the LCWR. Under pressure from Bishop Robert J. McManus of Worcester, Massachusetts, late last month, Anna Maria College, a Catholic institution in Worcester of about 1,200 students, rescinded its offer to Victoria Reggie Kennedy, widow of the late Sen. Edward Kennedy, to speak and receive an honorary degree in public administration, apparently because her views are out of line with Catholic teaching. Kennedy is a private citizen, lifelong Catholic, lawyer and founder of Common Sense about Kids and Guns, a nonprofit public education organization dedicated to providing adults with information empowering them to protect their children. She is not an appointed public official, holds no public office and is not running for any public office. The Boston Globe reported that, after the Worcester Telegram & Gazette announced Kennedy’s appearance at the school, the bishop approached Anna Maria College “arguing that on certain issues—particularly abortion and gay rights—Kennedy’s apparent beliefs made her an inappropriate choice.” The Boston Globe also quoted the diocese’s and Kennedy’s statements. Voice of the Faithful has noted that U.S. bishops are acting increasingly more like enforcers, demanding that Catholics obey, rather than acting like teachers and shepherds, guiding the faithful to right conscience. Some might say the bishops are reflecting a flawed culture of clericalism, whereby the hierarchy feels itself above and set apart from a laity not competent in mind or influence of the Holy Spirit to make moral decisions. Others might say the bishop was within his rights to pressure the college to take back its invitation. Read the following points of view and, considering them and the above, let us know what you think.